Vanity Fair's Hollywood Issue has become a editorial insitution. Each year the storied magazine hand picks the year's stand out film actors to feature on the cover. This year two Black actresses, Lupita Nyong'o of "12 Years A Slave" and Naomie Harris of "Mandela," were chosen. The tri-fold cover was shot beautifully to look like an oil painting come to life by veteran photographer Annie Leibovitz. 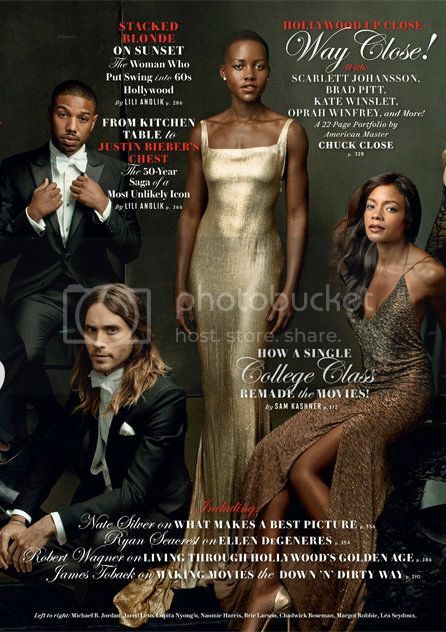 Chiwetel Ejiofor, Idris Elba, Michael B. Jordan, and Chadwick Boseman are also on the cover. View the full-size image here. For more on Vanity Fair's Hollywood Issue, pick up the March issue on newsstands Feb. 11.